Bridgeport, CT - The Greater Bridgeport Youth Orchestras (GBYO) and Fairfield County Children’s Choir (FCCC) in partnership with The University of Bridgeport will join to sing and perform music together at the upcoming Kids4Kids Benefit Concert, March 24th at 7:00 pm at the University of Bridgeport Arnold Bernhard Arts and Humanities Center, 84 Iranistan Avenue in Bridgeport. This concert is a benefit performance for Mikey’s Way Foundation of Fairfield. This special performance by two of the most prestigious youth organizations in the area will uplift the audience by listening to these talented youths making music together. GBYO’s Principal Orchestra will be performing Star Spangled Banner, Salute to the Armed Forces, and Stars & Stripes Forever. Krista Adams Santilli, Soprano, will sing God Bless America and Over the Rainbow with the orchestra. Symphony Orchestra will play Duke Ellington! and America The Beautiful. FCCC will be performing Jubilatedeo Praetorius, He Shall Feed his Flock Handel, Put on a Happy Face Birdie, Skimbleshanks: The Railway Cats Cats, Journey to the Past Anastasia, Wells Fargo Wagon Music Man, Gary, Indiana Music Man. The Grand Finale will feature FCCC singers and GBYO Principal Orchestra on stage together performing Goin Up Yonder and Hymn to Freedom. Mikey’s Way Foundation helps children with cancer and other life- threatening illnesses connect their family, friends, and school. The young patients are gifted laptop computers, tablets, and other internet-ready electronics to help alleviate the boredom they experience in the hospital during treatment. To learn more about Mikey’s Way Foundation, visit www.mikeysway.org. Greater Bridgeport Youth Orchestras has been providing music education and performance opportunities to young musicians since 1961. Its developmentally progressive music program gives ensemble members the opportunity to play at the highest level both individually and collectively. Members are selected by competitiveaudition and come from 35 communities all over Connecticut. GBYO strives for diversity and inclusivity in a social environment that is both fun and musically challenging. GBYO exposes all its 340 members to all types of symphonic literature and enriches their musical education. 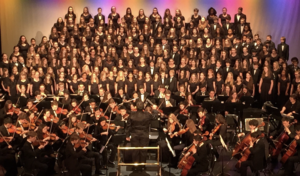 The mission of the Fairfield County Children’s Choir (FCCC) a community-based program made up of over 300 children in grades 4-12 from communities in and around Fairfield County, CT. The FCCC was founded in 1995 to provide the children the opportunity to participate in a musical experience which is challenging, rewarding and enjoyable. The FCCC program provides instruction in voice technique, choral technique, music literacy, and the appreciation of music through the practice and performance of great choral repertoire. Kids4Kids, Saturday, March 24, 7pm. University of Bridgeport Arnold Bernhard Arts and Humanities Center, 84 Iranistan Avenue, Bridgeport. Tickets are $15 at gbyo.tix.com or $20 at the door day of performance. For more information on FCCC and GBYO, please visit SingFCCC.org and GBYO.org.